PanARMENIAN.Net - The Armenian human rights defender, Arman Tatoyan, on Monday, March 18 visited the citizen of Azerbaijan who tried to illegally cross the border to Armenia. 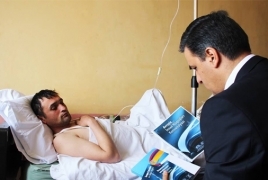 Tatoyan was accompanied by a doctor who examined the Azerbaijani national in the hospital. Tatoyan said in a tweet that he gave the Azerbaijani citizenthe European Convention on Human Rights in his native language and discussed family contacts with the National Security Service. "They are ready to organize any family communication, including meeting in Armenia," Tatoyan said.